Active Family Fun on Mondays! Come along and join Angela Bithell for Active Family Fun every Monday 3.30pm-5.30pm here at Everton Nursery School and Family Centre. All family members are welcome to take part as long as at least one child is aged under 5. If you would like to help volunteer to support the programme and help cook a meal. 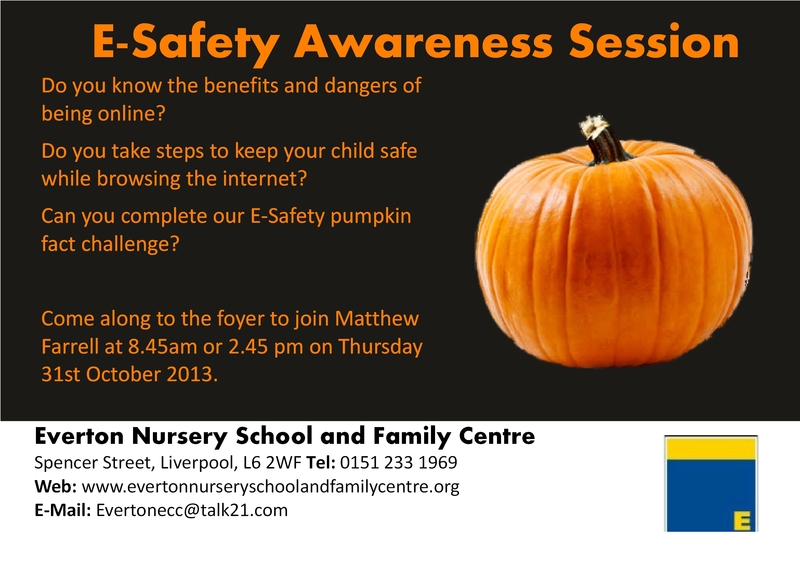 On Thursday 31st October we will be hosting two Parent/Carer E-Safety Awareness sessions. The sessions are at 8.45am and 2.45pm. The sessions will look at some online dangers and provide advice on how to keep yourself and your family safe online. Copies of Digital Parenting will be also available, a brilliant guide full of information for Parents/Carers. If you are unable to attend either session, please contact Evertonecc@talk21.com or ring 0151 233 1969 and alternative sessions will be arranged.